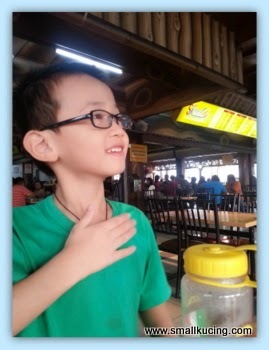 We dropped by Kajang for sate Kajang after playing at the paddling pool. Lucky arrived early...around 6pm. Not much crowd yet. Papa went and ordered some Satay for us. Hmmm....dunno why....maybe just our imagination but the satay here feel or seems to taste better that at their other outlets/branches. Again very generous with the gravy and sambal. 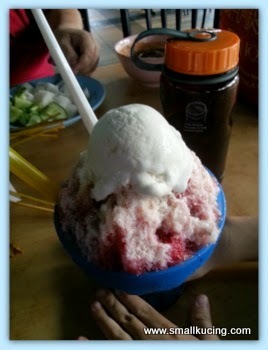 To cool off, Papa ordered ABC with Ice Cream topping. Yummy! I like this more than the satay. Probably coz I was a bit full already with the Roti John earlier on. Saw this cart outside the restaurant. Can't help myself. Climbed up and asked Mamarazzi to snap my photos. Also saw a motorcycle parked outside the restaurant. Wah.,... 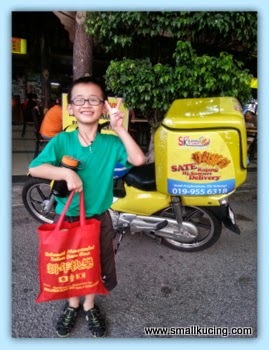 this Sate Kajang have delivery service leh. Fuiyoh! 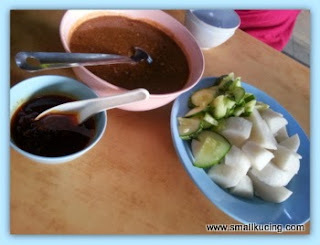 The famous satay kajang, I have yet to try them. The ABC really is good to eat on a hot day. You're on a roll to finding the best satays! :P What's ABC? It looks like ice kachang? Wahhhhh!!! Got home delivery! Nice cart! Nicer than the outlet in KL that day or the same? Sometimes, they use the name only, not original...like here, everywhere "Rojak Kassim" (they call rojak tambee but not the same - like gado gado) all not the same. Now business is expanding. Have delivery some more. 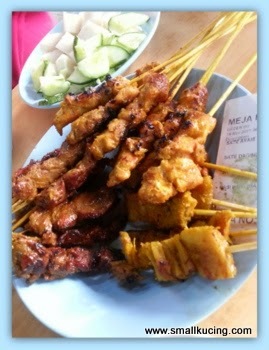 Fuiyoh, satay again, nice.. But I'm more attracted to the ABC ice cream.. I can finish two bowls of that, yummmzz...Wah, now making me very thirsty leh..
We go eat satay when we meet, ok? So, the original one still the best, huh? The next time you're in Kajang, maybe you can try the Nyok Lan one I told you about earlier....and surprisingly this one is run by Chinese (and the otak-otak is really good). ... yuuummmy!!! save me some, please? ... smiles ... enjoying your holiday from school, lil kitten? Love, cat. Can't remember if I've ever tried Kajang satay. Heard its not too bad. Must try soon. I love satay. Usually it is the original that tastes better than those from the branches. Nice cart. First time I hear satay has home delivery. The satay looks very good. The ice cream looks good too but I can't eat that stuff. Everything looks delicious! I want that ice cream topped dessert! Look very touristy taking photo with the delivery bike! Hold shopping bag some more. I have eaten satay in Kajang many times over the years and they all tasted good to me. I cannot even tell which is the best and worst. Semua bagus and their gravy sauce is thick with peanuts. That stall you ate, I have been there the most too. 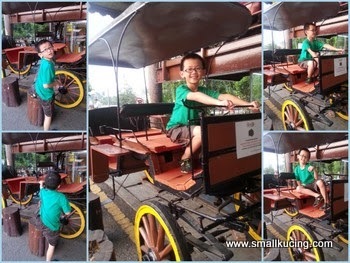 I went to Kajang to do work lah otherwise I won't visit there.